So, since my last post regarding HTC’s total lack of respect for their paying customers, there has been some movement. Device HTC One M9, Serial No. ************, is now awaiting shipment in our warehouse and should be returned to you within a couple of days. Why are you changing most of the components for a simple screen repair? 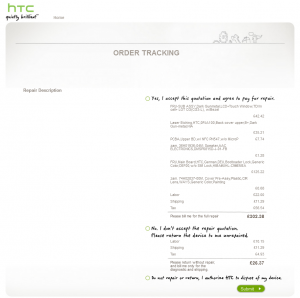 Why does HTC seem to have their own special VAT rate of 23% when the rest of the UK has 20%? 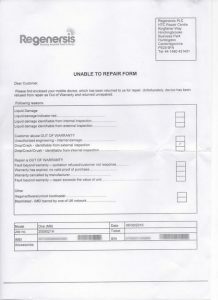 Is to simply send it back and refuse to repair it. Anyhoo, what with arranging redelivery etc., I finally had my phone back in my hands on Thursday 7th July. I turned it on and it was (still) working fine – just the smashed screen to contend with. 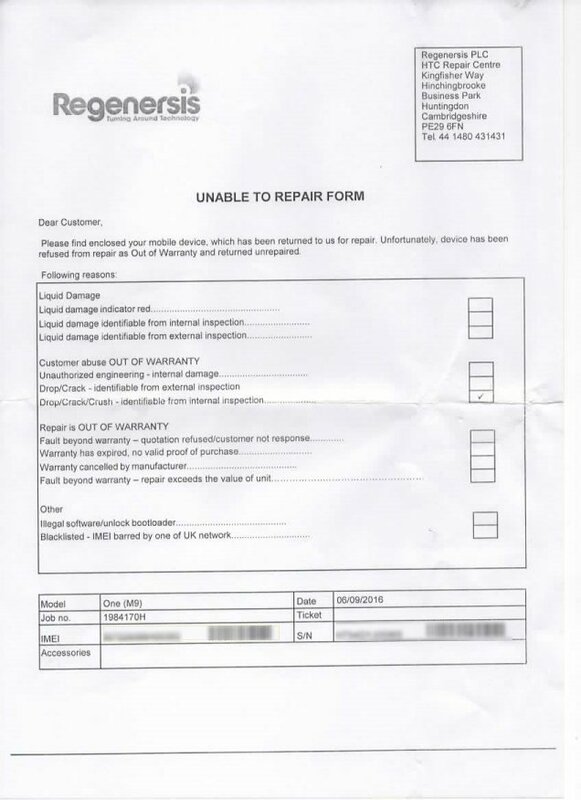 Document 1 is pretty straight forward, apart from the Polish address (the phone went to, and came back from Huntingdon), and reads exactly like Regenersis are contracted to HTC for repairs and have been instructed by HTC to release the phone. Documents 2 and 3 are very contradictory though; assuming the US date format, the first is dated June 9th and says it was internally inspected…some 4 days before I sent it in. Pretty impressive huh? Wearing my best wry smile at the confusion created by the documents, I searched online and found a company – RaPhone – based in London, who for an all in charge of £89 will replace the LCD and touch screen of an HTC M9. I packaged the phone up again and off it went first class the following day (8th July). 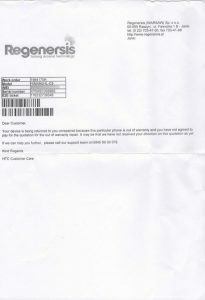 Monitoring online, the phone was received by them Saturday morning, and THE PHONE REPAIRED BEFORE 4PM THAT DAY. 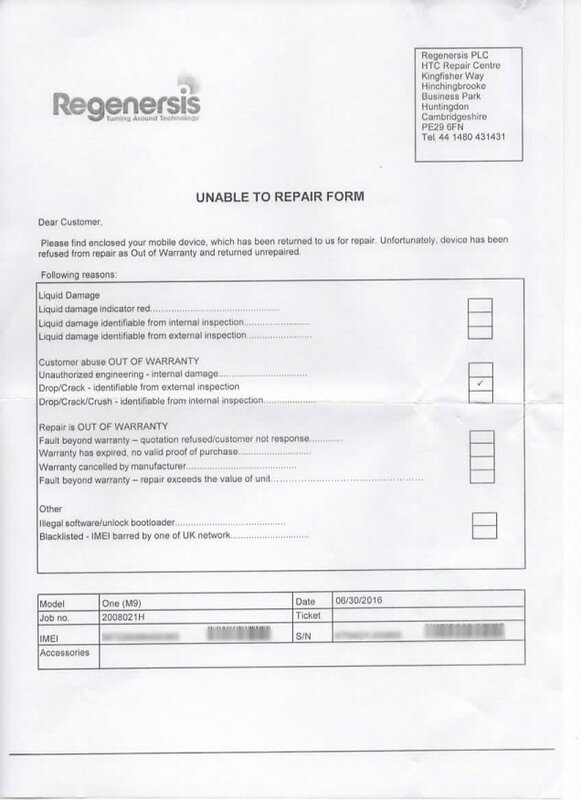 The phone was promptly returned to me on Tuesday (12th July) – only the weekend stopped this being a 48 hours turnaround it seems. Phone is working perfectly – screen, sound etc. all perfect. So why did HTC feel the need for new components? 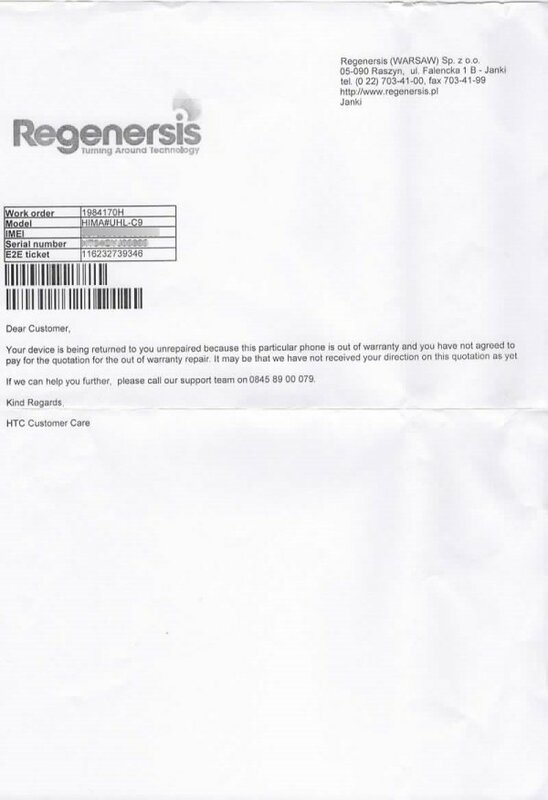 I will still be in touch with HMRC regarding the illegal rate of tax being charged by HTC UK, and I’m sure Trading Standards will be very interested to hear about this whole fiasco. All in all, it took 4 weeks to have a 48 hours repair done.